This is the River Clyde from the water’s edge at Kirn by Dunoon. The landmass jutting in on the left is the Rosneath peninsula from Argyll between two naval bases. The land on the right is Greenock and Gourock in Inverclyde. 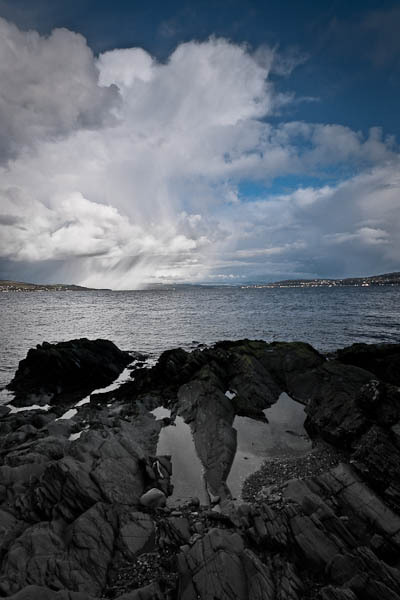 I was amazed to see a downpour happening in Rosneath while Greenock was dry. These were amazing clouds. I snatched my LX3 from the car hopped down to the beach and grabbed a few handheld and wide at 24mm. Aperture closed down to f5.6 (small for the LX3 sensor) and ISO on 80. I was delighted to get 1/800th of a second as a result; yay, spring must be here. For the pixel peepers, there is still some noise at ISO 80, not bad, but it’s there.